↑ Rao G.A., Mahulikar S.P. (2002). "Integrated review of stealth technology and its role in airpower". Aeronautical Journal. 106 (1066): 629–641. ↑ Richelson, J.T. (10 सितंबर 2001). "Science, Technology and the CIA". The National Security Archive. The George Washington University. अभिगमन तिथि 6 अक्टूबर 2009. ↑ Merlin, P.W. 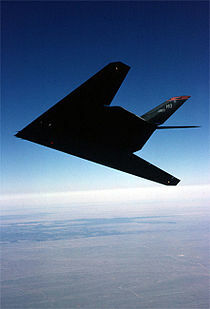 "Design and Development of the Blackbird: Challenges and Lessons Learned" American Institute of Aeronautics and Astronautics 47th AIAA Aerospace Sciences Meeting Including The New Horizons Forum and Aerospace Exposition 5–8 जनवरी 2009, Orlando, Florida. Accessed 2009-10-06. ↑ Cadirci, S. "RF Stealth (or Low Observable) and Counter- RF Stealth Technologies: Implications of Counter- RF Stealth Solutions for Turkish Air Force." Naval Postgraduate School, Monterey California, Ph.D. Thesis. March 2009. Accessed 6 अक्टूबर 2009.